Bots have a wide range of purposes, and not all of them are bad. 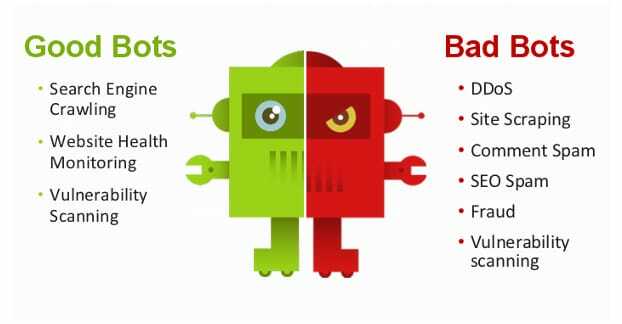 Some bots, like the bots wielded by Google and Bing, crawl and index your pages. If you were to block the Googlebot, your site will eventually be removed from their index; they can no longer access it, so your content won’t show up. Other bots have more niche uses. There are bots that exist solely to crawl e-commerce websites, looking for deals. They cross-reference every e-shop they can find with a given product, so the home site can show the prices for the product at a wide range of shops. Some sites will use these to ensure they’re at the top of the list, which is why a lot of Amazon listings will gradually creep down a few cents every day; competing sellers out-listing each other by tweaking prices down a penny or two at a time. Other bots are less benign. Spam bots will search blogs looking for various comment systems they know how to exploit. Comments without authentication or captchas can be filled out by bots, and spam comments can be left to build link juice to spam sites, capture the clicks of ignorant web users, or even bomb an otherwise benign site with negative SEO. Hacker bots exist to crawl the web looking at site infrastructure. They test domains for common /admin.htm style URLs, looking for websites that use a default CMS and haven’t changed things like the username or password. They search for vulnerable sites, the low hanging fruit, that they can access and exploit. They might harvest admin or user information, or just report URLs back to the owner of the hacker bot. They might be programmed to simply take down a site and replace it with their own content. Current time: 04-26-2019, 11:58 AM Powered By MyBB, © 2002-2019 MyBB Group.